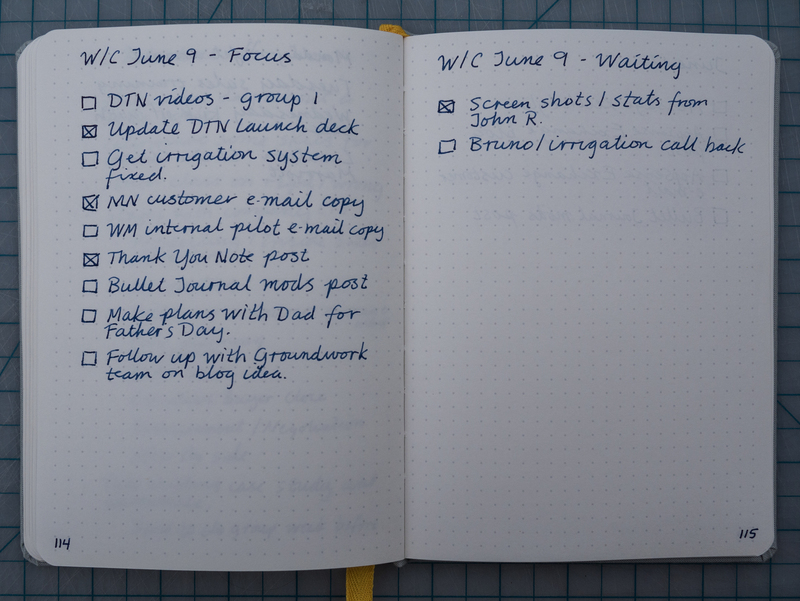 As I've written about before, Ryder Carroll's Bullet Journal methodology played a major role in bringing pens and paper to the center of how I think and get things done. But it's just one of the many great paper-based systems out there. There is no “one true way” for any of this stuff. Perhaps you like the functionality of my Dash/Plus system but wish you also had the calendar/index of the Bullet Journal system. Mash them up? Maybe there is something that you want to track that is not covered in any of the above — make up your own. That is the beauty of this stuff (and paper and pen in general) — you’re not locked into someone else’s idea of how a thing should work. The page is blank, own it. When I first adopted Bullet Journal, I stuck to the playbook very faithfully. The structure and discipline really helped me avoid slipping into old habits. Over time, however, I started to rub against some limitations of the "stock" Bullet Journal methodology. As a result, I've made several modifications to suit my personal needs. While I've shifted exclusively to paper for task management and journaling, I still maintain my calendar electronically. My schedule is just too fluid and interdependent on others to move offline. I resolved this by ditching the monthly calendar view and linking my master task list to the life of the notebook rather than the calendar month. At my current pace of notebook consumption, a "monthly" task list that actually covers 1.5 months isn't really all that different in practice. But instead of getting stressed by an artificial review deadline the first calendar day of each month, I just spend some time during the last 20 or so pages of each notebook cleaning up open items and getting my head around what will need to be carried over to my next book. A month that straddles two different notebooks now seems perfectly natural. It's also much more comfortable spreading my big (almost) monthly review over a few days. I treat my master (formerly "monthly") task list as a set of things that I want to do at some point in the next month or two. I treat my daily bullet list as a set of things I want to get done today. But I've found that many of my new tasks don't fit neatly into either bucket. Most of my new tasks are somewhat urgent but can't necessarily be accomplished on the very same day that I capture them. I addressed this by adding a weekly "Focus" page. I build my Focus page at the beginning of each week by carrying items over from the previous week and pulling new items in from the my master task list. Then, when new items pop up during the week that fit into that "needs to get done in the next few days" bucket, they go on this list. I always end up carrying a few over to the next week, but the point is that it's a short enough list that I will actually touch it daily without loading up my daily list with things that I know won't get done. The other thing that stock Bullet Journal was missing for me was a way to keep track of items that I was waiting for others to take action on. This is the classic @waiting context in Getting Things Done parlance. It's distracting to have an open item on your to do list that you can't take action on. At the same time, checking it off because you've put the ball in someone else's court leaves loose ends. I solved this by creating a weekly "Waiting" page on the opposed side of the spread from my Focus page. When I complete an item on my list that generates an action for someone else, I note it on the Waiting page. Due to its location opposite the Focus page, these items stay on my radar screen. I'll also give the Waiting page a quick glance when I'm on the phone with my boss or closest colleagues. I still consider myself a Bullet Journal disciple. However, my journal looks less and less like a pure Bullet Journal as time goes on. Ditching the monthly cadence is a particularly significant deviation. But I think it supports Patrick's point that where you start is less important than the thought you put into how to make a paper-based markup system your own.